I am using the Natural World Art Society's Gallery located at Banham Zoo in Norfolk to hold a lovely exhibition of my artwork. 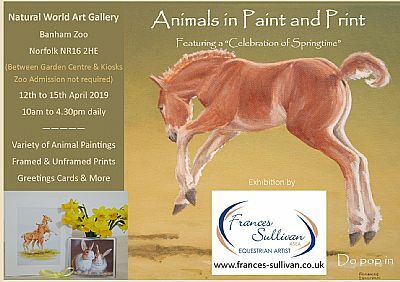 There will be original paintings, framed and unframed prints, greetings cards etc featuring a variety of animals: wild and domestic, with a wall featuring young animals expecially for Spring. FREE entry - Zoo admission NOT required. Do pop in if you can. Find a changing selection of my original paintings, viewed from many sides, in my on-line Shop. Do check them out, alongside a wide selection of delightful horsey, pet, farm or wildlife greetings cards, prints and gifts. New products and Special Offers are added regularly. View my Gallery, for more original paintings, though personal viewing at events/exhibitions is recommended to fully appreciate the detail and nuances of colour. If you can't see exactly what you are looking for I may be able to paint to your requirements by commission. If you would like me to paint a lovely working horse scene for example, or a lasting remembrance of your animal, or that of a friend or relative, for an extra special gift. My "Commissions" pages have advice to guide you. At long last I am now on Facebook - at Frances Sullivan Animal Art, if you would like to "like" or "follow" me. More Suffolk Horses are coming to life on my canvases also birds from a recent trip to Hunstanton where oystercatchers, turnstones and sanderlings were busy on the beach. If you have any suggestions for either animals, breeds or genre, such working horses or perhaps farm animals in landscapes, please get in touch. I am an Associate Member of the Society of Equestrian Artists and in addition to my work being found in many private collections as far afield as Australia and the US, my work can also be seen widely across East Anglia and at other venues in the UK.